This weekend, Iowa Gun Owners will be at the Marshalltown Gun Show, in the heart of Senator Steve Sodders’s legislative district! We’ll be out there mobilizing gun owners to fight for the 2nd Amendment, passing out decals, and giving out T-Shirts with to anyone who joins up as a member. But this show will be particularly fun as we’ll also be exposing notoriously anti-gun Senator Steve Sodders to thousands of gun owners in Senate District 36! Sodders is doing his best to fool gun owners about his record on the 2nd Amendment — he has to — he has an election later this year. But we’ll be there, in force, to make sure that everyone knows that Sodders has killed Constitutional Carry, Stand-Your-Ground law, and over a dozen other pro-gun bills over the past few years! We’d love to see you out there, so stop by and get involved! It would also be an excellent time for you to get involved in our fight to advance Stand-Your-Ground law here in Iowa — just as thousands of other Iowans did at gun shows in Clive and LeMars last weekend! Anti-gunners in Des Moines are desperately hoping that gun owners “just shut up and go away” for the rest of the year. They especially want you to forget about what they’ve done to stomp on your gun rights as we approach the Fall elections! That’s not going to happen, as we’ll be there, making sure that gun owners know the truth. But we could use your help! 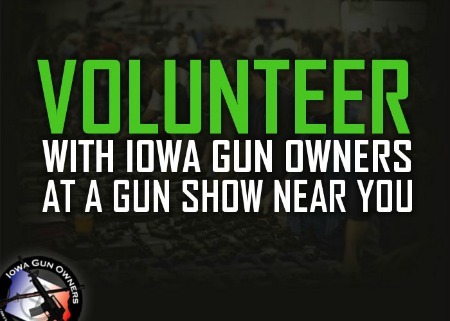 If you are able, Iowa Gun Owners is looking for a few more volunteers to help us man the booth on Saturday. So if you can help us out, please hit the link below and we’ll be in touch with you! In addition, take a look at this list of gun shows that Iowa Gun Owners will be a part of over the next couple of weeks! Again, Iowa Gun Owners will be at the gun show in Marshalltown this weekend — come on out and join our fight to defend the Second Amendment in Iowa! P.S. Iowa Gun Owners will be at the Marshalltown Gun Show this Friday and Saturday! The show is being held at the Central Iowa Fairground, located at 1308 Olive St. in Marshalltown – the heart of anti-gun State Senator Steve Sodder’s district! Stop in and join in the 2nd Amendment fight, and while you’re there, you can pick up a free decal, sign your Stand-Your-Ground petition, pick up some free “No Guns – No Money” business cards, join IGO and receive a FREE T-Shirt!